A few months back, I traveled to Phuket, Thailand to work on a cable TV show. For 7 weeks, every day, my fellow crew and I drove to set, passing by this small house along the way. A handmade sign on a post caught my eye that first day and made me smile. It simply said, in English, Man Haircut. As soon as I saw it, I knew it was a future Manly Monday segment...but who would be my victim? I chose Tomas, a good friend of mine from Argentina, who is a cameraman on the show. His hair had gotten long by the end of the shoot and was open, as many of my traveling colleagues are, to a new experience, however off kilter that may become. Perfect. When we arrived, this older man appeared. He didn't speak a word of English but as is often the case when traveling, much could be communicated through body language. 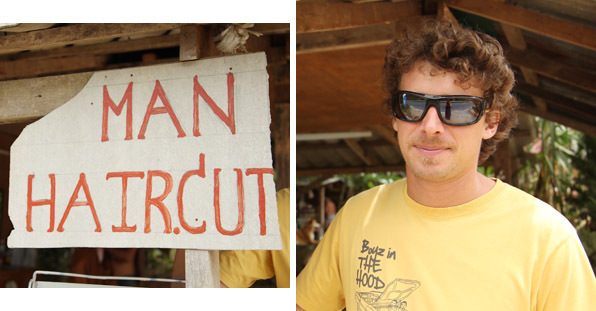 Tomas sat down, pointed to his long curls and the only thing we knew for sure was, he was about to get a man haircut. My friend Manwe lives in Thailand and he was kind enough to go back a week or so later and ask the man a few questions. His name is Charoun Songdeng but goes by the nickname Nui. He's 65 years old (Manwe noted it took a minute for him to remember how old he really was) Nui has been a barber in his local Nai Thon village for over 20 years. Before that, he was a construction worker and a farm hand. Nui only does men's hair and says his prices are way cheaper than you'll find down at the beach, about a mile away. (He charged Tomas $3) Most of Nui's clients are regulars. Manwe, "As I was interviewing him, a taxi driver drove past and shouted that he will be back in half an hour for a haircut." It took about 30 minutes from start to finish. Nui was slow yet purposeful, quiet and kind. When Manwe asked Nui what he liked or disliked about his job, he replied, "I can't think of anything I don't like. It's all good and keeps me busy." My initial fear was that Nui would cut Tomas' hair too short but rest assured, it was the perfect length. We thanked Nui in Thai- hands held together in prayer pose, offering a slight bow in gratitude. 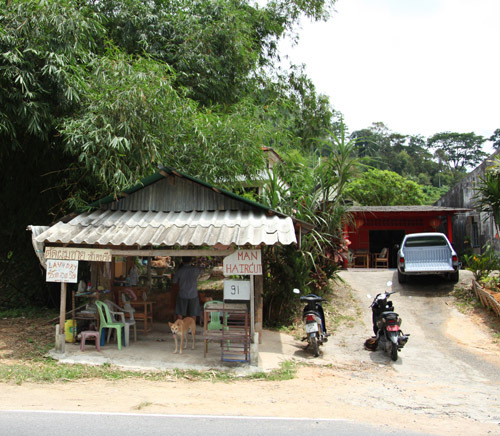 It was here, on the side of the road in a small Thai village, that words carried little weight. All that mattered was all we had- a shared understanding of a man who needs a haircut.